USA’s Noah Lyles was among the winners on the second day of the IAAF World U20 Championships in Bydgoszcz, Poland, as a total of six titles were claimed. 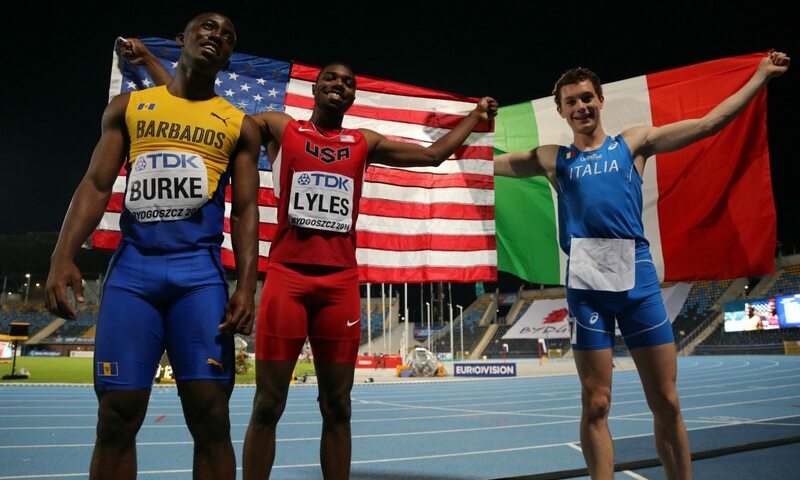 The 18-year-old, who finished fourth over 200m at the recent US Olympic trials, clocked 10.17 to claim victory ahead of Italy’s Filippo Tortu with 10.24 and Mario Burke of Barbados with 10.26. Things had been close halfway into the race, but as Lyles began to move away from his rivals, Britain’s world youth bronze medallist Rechmial Miller pulled up with cramp. Miller’s team-mate Oliver Bromby had run a 10.37 PB in the semi-finals but missed out on the final by a fraction as Miller secured the last qualifying place. Germany’s Niklas Kaul secured victory in the decathlon after an eight-second PB of 4:21.70 in the final event, the 1500m, took his score to 8162 points. He also threw a world under-20 decathlon javelin best of 71.59m. That championship record is also a world best within the under-20 decathlon (though 8397 is currently the official world under-20 record but that was set in the senior specification decathlon). Maksim Andraloits of Belarus had led the competition from events three to nine and secured silver with a 8046-point national under-20 record, while Johannes Erm got bronze with a 7879-point Estonian under-20 record. 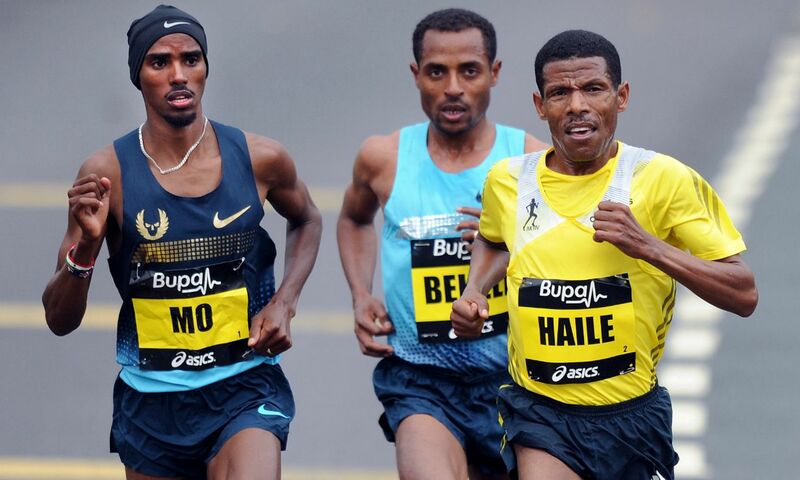 Ethiopia’s Beyenu Degefa broke a championship record which had been set in 1992 to claim the 3000m title. The 17-year-old clocked 8:41.76 after a 61.9 last lap and 30 second 200m to beat Bahrain’s Dalila Abdulkadir Gosa with 8:46.42 and Germany’s European junior cross country champion Konstanze Klosterhalfen with 8:46.74 – both of those national under-20 records. In total, 13 of the 17 athletes ran PBs. Germany’s Alina Kenzel dominated the shot put competition. The 18-year-old started off with a throw of 16.91m which she improved to a world U20-leading PB of 17.58m in the third round for victory. China’s Song Jiayuan secured silver with 16.36m, while USA’s Alyssa Wilson won bronze with 16.33m. The men’s long jump gold was claimed by Cuba’s Maykel Masso, who added the world under-20 title to his world under-18 gold from last year following his winning leap of 8.00m in Poland. Miltiadis Tentoglou of Greece came close with 7.91m for silver, while bronze went to Australia’s Darcy Roper who was just three centimetres off that mark with 7.88m. Klaudia Maruszewska was a surprise winner of the javelin title on home soil, as she threw a 57.59m PB on her first attempt to get gold for Poland ahead of South Africa’s Jo-Ane van Dyk with a 57.32m PB and Turkey’s Eda Tugsuz with 56.71m. Also in action on day two in Bydgoszcz was Britain’s women’s team captain Imani Lansiquot, who led by example to win her 100m heat in a PB of 11.17 to move to second on the UK under-20 all-time list and joint 10th on the overall UK all-time list. She will be joined in the semi-finals by team-mate Hannah Brier who finished second in her heat in 11.63. Britain’s Matthew Treston, celebrating his 18th birthday, and James Weaver, progressed to the 110m hurdles final after respective semi-final times of 13.70 and 13.40, while Cameron Chalmers booked his place in the 400m semi-finals after running 46.91 for third in his heat. Tom Gale cleared 2.16m to progress to the high jump final but he will not be joined by team-mate Rory Dwyer after a best of 2.09m, while Hannah Williams came close to the 400m final but just missed out despite running a PB of 52.80. Lily Beckford finished seventh in her 400m semi-final with 54.88.